You’re right. It was James Brown and not George Clinton who coined that prescient phrase. I mean no disrespect to Mr. Brown (who will be covered in detail at a later date), but let’s face the facts people. George Clinton lived this phrase more believably than the Godfather of Soul. George Clinton was a whole lot skinnier for one thing. You would be too if you were fronting Parliament and Funkadelic all the while plotting to paint the White House black, extolling the virtues of Washington D.C as The Chocolate City, inventing the Bop Gun, building the Mothership and laying the ground work for The Brides of Funkenstein and Parlet! Let alone a funky, funky solo career. All this while JB was endorsing Richard Nixon for president, growing a mustache and wearing two girdles. I know, I know. JB made his mark on a ton of projects himself with The J.B.s, Fred Wesley’s bands, Lyn Collins, Bobby Byrd and his own awesome Polydor imprint - People Records! And, JB played a concert in Zaire! That is awesome. But this isn’t a JB story now is it. It’s the story of Funkadelic’s Greatest Hits. Funkadelic’s Greatest Hits came out in 1975 and from what I understand it was a contractual obligation Mr. Clinton owed to Westbound Records before jumping ship to Warner Brothers. As far as contractual albums go this is an awesome one. Look at that funky funky black sheep. That nappy wool hides within it the makings of some life altering funky cuts. My faves include I Wanna Know If It’s Good To You, Cosmic Slop, Loose Booty and I’ll Bet You. Then again, who can’t love a cut called I Got a Thing, You Got A Thing, Everybody’s Got A Thing. I think this was George Clinton’s foray into healing a pre-post-racial America. Get me? The album’s got Funky Dollar Bill which is always fun. It’s also a cool name for any dude named Bill in my opinion, though I’m not sure my old man would go for it. What some people may not realize about early Funkadelic (defined by me as 1969 -1975) is that they rocked as hard as they funked. I’m talking Hendrixian lead guitar that has a mean bite from the inimitable Eddie Hazel. Seriously psychedelic Bernie Worrell’d keyboards, a fantastically diapered Gary Shider and Tiki Fulwood on drums. For brevity I’m leaving out the other 19 members of the band. For Weirdos Only: Westbound Records! What an amazing label. Can you imagine working at that place in the early 1970s? Bumping into Funkadelic AND The Ohio Players in the same building! Westbound Records was founded by one funky cat named Armen Boladian in ‘69 or '70. As I understand it he still owns the label located in Southfield, MI. That’s just outside another Chocolate City - Detroit. I have a special place in my heart for Westbound. They signed two great funk bands only to lose them to the major labels in the mid-1970s. Keep it funky Westbound. Keep it funky. It Began With a Kiss. Why not start at the beginning? The beginning for me was this slab of wax, more or less. I say more or less because I can’t be certain if this was actually thee first Kiss album that transformed me from casual AM radio listener to purchaser of records. I think it was this record. And I heard it blaring through some crappy speakers in my cousin Ben’s bedroom circa 1975. Look at this cover and tell me this isn’t a mid-70s American dream. The snarls. The hair. The make-up! Speaking of make-up, look closely and you’ll notice it’s different from the Kiss make-up on subsequent albums (and tours). Peter’s make-up is especially more detailed. Since this record - Kiss’ first long player - came out in 1974 it means I was close to hearing them at the dawn of their major label existence. I can’t pretend I was old enough (I was 7 or 8) or cool enough (I wasn’t) to understand all of it, but whatever it was I wanted an extra helping. Either way, it’s their first LP you see before you. And man, does it rock! Strutter! Firehouse (with el cheapo sirens!)! Cold Gin! Black Diamond! And, my favorite - Deuce!!! I didn’t know what ANY of these songs were about but they got me playing air guitar right quick. Speaking of Deuce - “You know your man is working hard….he’s worth a Deuce!” What does it mean? One line I DID understand was “Get up and get your grandma outta here.” Even though I loved my Grandmas’ with all my heart, I loved how dangerous that sounded. I used to imagine Kiss kicking in my parents front door and playing an impromptu set for my slackjawed, screaming family! And then begging me to join the band - on air guitar. Whenever I listen to this record it conjures up live performances on Wolfman Jack’s Midnight Special and Don Kirshner’s Rock Concert. And, in my mind, it’s always a hot July day. My mom’s got frosted hair, my brother’s cooking up a mess of hotdogs in the kitchen (he wasn’t allowed to but did routinely) and my dad’s mad at me for using toothpaste to build a false wall in my bedroom. The music? It pours out of an AM radio like flaming hot molten lead. For weirdos only: You’ll notice that I have an original blue label Casablanca pressing. Or should I say second pressing? 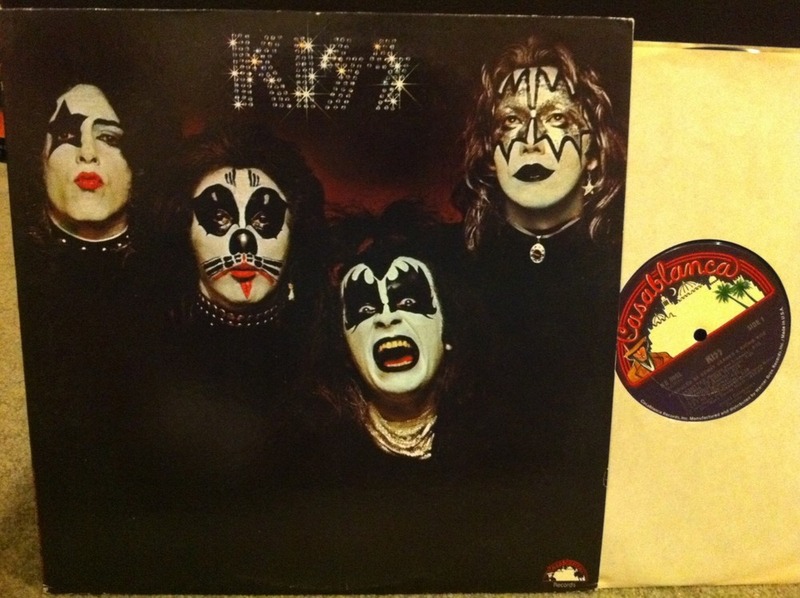 Rock ‘n’ roll weirdos know that the initial pressings of Kiss’ first LP (NB-9001) - released in February of 1974 - were missing the song Kissin’ Time. Here’s the weird thing. My pressing is NB-9001 - but it contains Kissin’ Time. From what I understand, that means my pressing was released in July of 1974. Five months can make a big difference. In September of 1974 the LP was reissued as NB-7001. Pretty weird to generate all these unique pressings for a record that didn’t sell very well. The big sales would come later - with the release of the fourth Kiss album - Kiss Alive! More on that later, freaques. 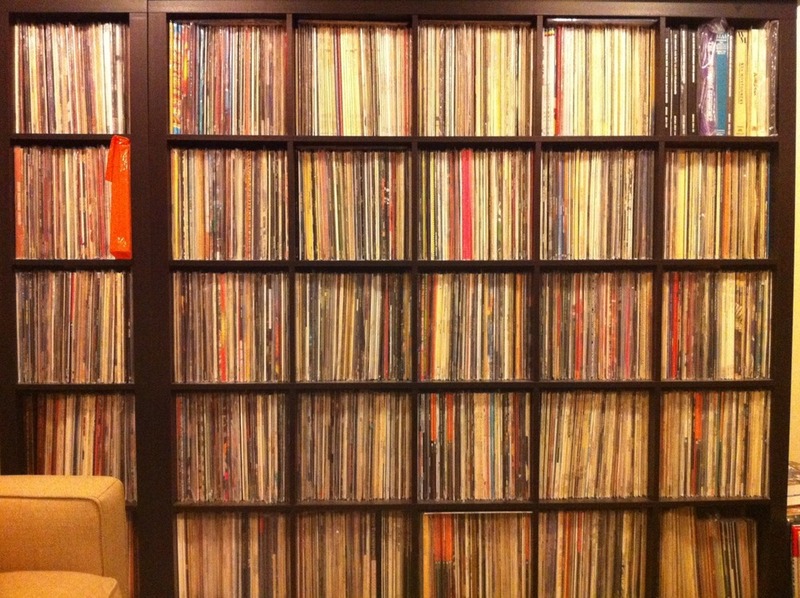 This will be the only place where you can read about my records and what I think about them. Take that!